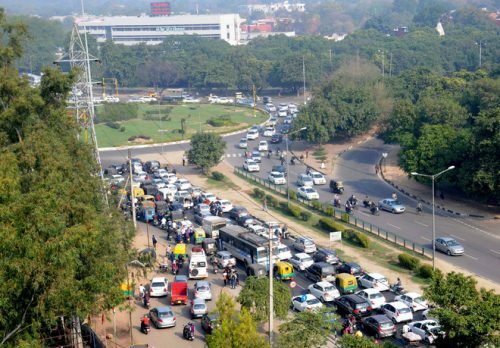 Chandigarh : Traffic congestion at the busiest Tribune Chowk will soon be a past as very soon a flyover or an underpass will be constructed to ease out the flow of traffic. Union Minister of Road Transport and Highways Shri Nitin Gadkari today announced that he has approved the proposal to solve the traffic problem at Tribune Chowk. Mr. Gadkari told media persons at International Airport that his ministry will appoint a consultant to study the problem and suggest a solution. Based on the report of consultant it will be decided in consultation with officials of UT administration whether flyover or an underpass will be constructed at Tribune Chowk. He further assured that the work will be started very soon. He said he has received the proposal from Member of Parliament Smt. Kirron Kher yesterday for finding a solution for the increasing traffic congestion at Tribune Chowk and after talking to officials of his ministry he immediately approved this as this is need of the city. He said that the UT administration has been informed about it. Mr. Gadkari had a brief halt at International Airport, Mohali. He is on two day tour to Himachal Pradesh to inaugurate some projects. Smt. Kirron Kher thanked Mr. Gadkari for approving the proposal within 24 hours of request made by her. She said this will a history as approval at such a pace has never been given in the past. It may be mentioned that Smt. Kirron Kher had written a letter letter to Mr. Gadkari yesterday mentioning that some sort of flyover or combination of flyover and underpass be constructed at Tribune Chowk so that there is no traffic congestion at this Chowk. She had stated in her letter that as this important junction falls on National Highway 5, in principle, approval be granted to this work at the earliest. Smt. Kher had mentioned that when Chandigarh came into existence in 1950’s, the Tribune Chowk was an extremity of the city, therefore handling the vehicular movement was easy, as the vehicular density was very low at that point of time. Mr Nitin Gadkari Said that his government is committed to built Delhi Katra Expressway which will reduce the journey from 10-12 hrs to 4-6 hours. This Expressway will increase the connectivity between New Delhi and Katra and it will be much better that Mumbai-Pune Expressway. The expressway will cover 600 kms and will be India’s longest. It will pass through Haryana, Punjab and J&K. He told media persons that software is being prepared to work on the identification of black spots where accidents take place very often. This project will also be implemented in Chandigarh to identify black spots. Union Minister of Health and Family Welfare Mr. JP Nadda today announced that on the recommendation of the Medical Council of India (MCI) Health Ministry has approved renewal of 100 seats to Government Medical College and Hospital in Sector 32. While interacting with media persons at International Airport, Mohali he said that this will give a big relief to medical aspirants. Smt. Kirron Kher said that she is thankful to Mr. Nadda for approving this renewal as she had been strongly demanding this for the last few months. Smt. Kher had also written a letter to Union Minister of Health and Family Welfare requesting him to sanction 100 MBBS seats for the institute.